It just keeps getting better and better! What, you ask? The Relay, of course! But why does it keep getting better? I'm sure for Team Ménage à Douze it's partly because we've done it five times and so we know the course intimately. We are also a local team, which helps. The variations in weather, always fantastic for running, make the race interesting and different from year to year. And, of course, race management seems to have this thing down to a science, in spite of the huge and increasing amount of work that's involved in putting this event on. 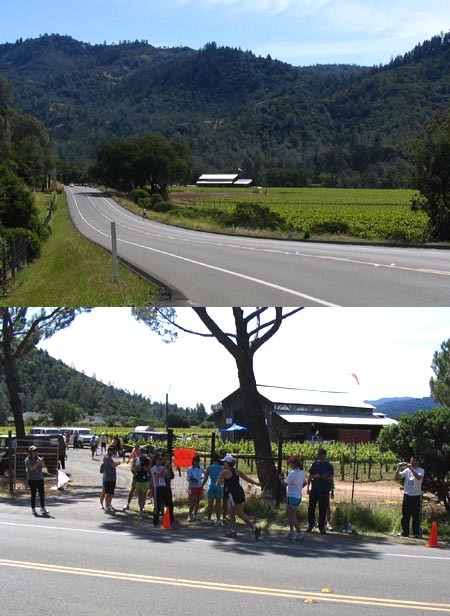 The major reason The Relay keeps getting better is the volunteers who show up at all hours of the day and night, in unusual places, to work the runner exchanges, timing the teams as they wind their way from Calistoga to Santa Cruz. At a minimum there are four volunteers at each exchange, often more, while it is open. That represents more than 150 people alone who come out and get involved. There are also volunteers who put up and take down the directional signs, also marking the course with flour, for 199 miles. Other volunteers open, oversee, and close the runner exchanges. Ham radio operators volunteer their time to provide communications, especially for areas where no cell phone service is available, and land and facility owners volunteer their properties for exchanges, trails, and services. There are many, many volunteers who work tirelessly to make The Relay happen, and a lot of them recruit friends, family, and neighbors to volunteer as well. On Leg 17, one I am very familiar with (Corte Madera to Sausalito), more than a dozen cyclists were available to accompany runners through a difficult set of dark, tricky turns until after four o'clock Sunday morning. These people had no formal ties to The Relay but wanted to support the Organ and Tissue donation message by adding additional manpower to make sure that runners felt safe and had a good experience at a crucial point on the course. A fact I believe is lost on many competitors is the true importance of these volunteers, no matter how big or small the race. Without them The Relay could not be held. There would be no race. And while it's true that most teams are required to provide two volunteers, those people have to be willing to get out of bed at 1 AM to show up at an exchange for a 2 AM shift. They have to be committed to fulfilling their promise to their team and to ensure the success of the race. If the volunteers are standing there when you come through the runner exchange, you owe them a debt of thanks. They're pretty important to you. 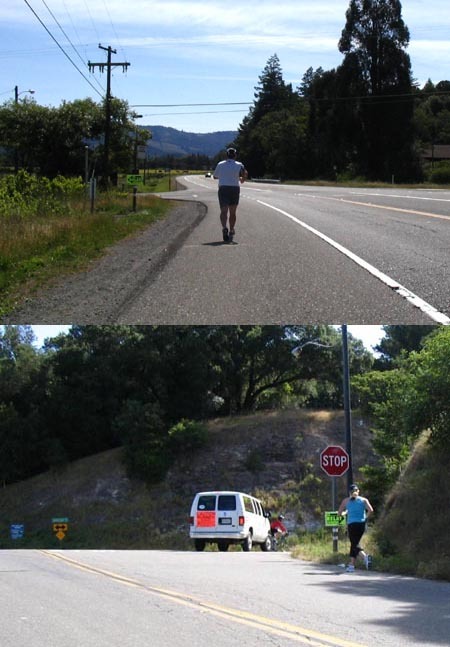 Editors note: Many thanks to Jack and Gayle Burns for serving on the volunteer Relay Committee since 1997 and soliciting 10 or more volunteers each year to assist runners through Marin in the middle of the night. Under Captain Jack's leadership, Ménage à Douze won the submasters mixed division in 1997, 1998, 1999 and 2000. The purpose of the 2000 Relay is to bring awareness to the need for organ donors. 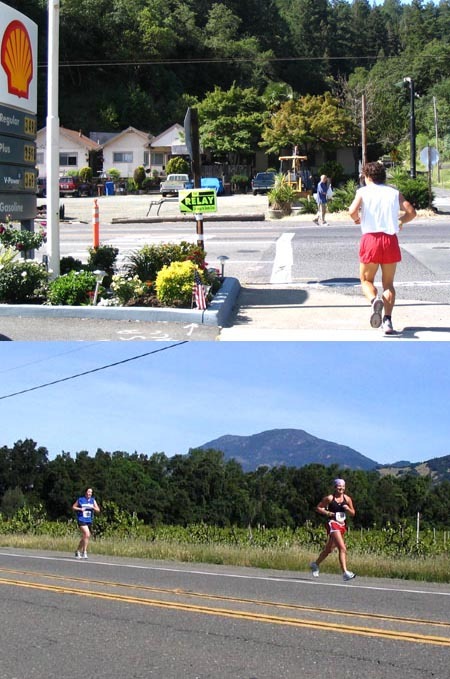 The course is 199 miles, beginning in Calistoga and ending at the Boardwalk in Santa Cruz. Women on the Run (WOTR) brought together 5 teams, totaling 60 women. A team is made up of 2 vans, 2 drivers, and 12 runners (6 runners per van). 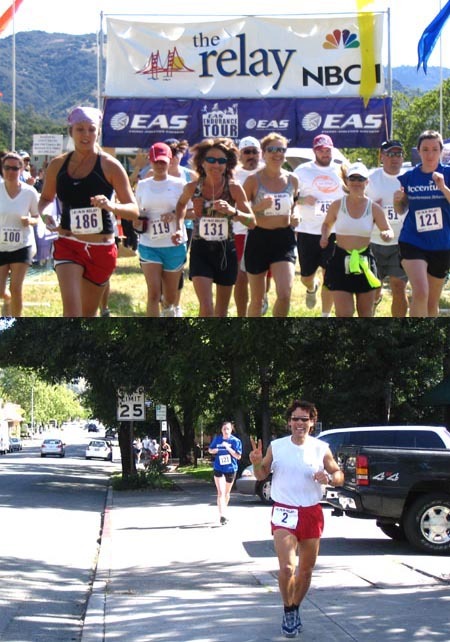 Each runner completes 3 legs ranging in distance from 3 miles to 8.9 miles. Our team was "U-Haul, Second Date" and what we lacked in pace, we made up for in humor, attitude and style. Some of the women on Second Date could easily qualify for the Boston Marathon, but God bless 'em, they chose to run with us. Undoubtedly, their participation ensured we would cross the finish line well before the start of the 2001 Relay. We were off to an auspicious start after discovering our 12-woman team had been classified in the "Open Men's" category. A heated discussion ensued about using an appropriate strap-on device as our baton. In deference to our mothers, we decided to stick with the flexible wristband. Our fearless team captain, Lisa Stripe Dibble, was one wicked captain. Her training regimen would make even the most veteran of runners cringe. But she did vow that next year she would, in addition to Salsa dancing, do some running prior to The Relay. Never one to mince words, Stripe was horrified at the behavior of the faster WOTR teams. When they arrived at a host house, the runners didn't rest. "The least they could do," she sniffed, "is to try not to have so much energy after completing their legs. It just doesn't show good sportsmanship." We nodded in appreciative agreement. Second Date did have sympathetic moments. We had been patiently waiting for Van 2 to arrive at Leg 12 when a disoriented male runner approached us. "Is this Leg 11?" he panted. We sadly shook our heads. "Sorry, this is Leg 12." "Leg 12!" He almost cried. "My ride left me here! I have to get back to Leg 11!" We watched in sympathy as he attempted to hustle a ride back to the missed leg. Fifteen minutes later, our cell phone rang out. "Where the heck are you guys?" barked Van #2. "We're waiting for you at Leg 12," we chided. "We're at Leg 12 and we don't see you! You are at the Cheese Factory, aren't you?" " we had a solemn moment of silence (followed by the Serenity Prayer) and we all donned disguises in case the misdirected runner came looking for us. Fortunately it was dark, and we did have a head start on the guy. Certainly, an event like this does not happen easily. The logistics boggle the mind. The volunteers keep everything running smoothly - sometimes even the runners. There was food; there were beds, friendly greeters to welcome weary runners. There were van drivers and cheering sections and there were people who (fortunately) gave correct directions to lost runners. In the WOTR camp, there was Karen Trilevsky of Full Bloom, Terri Hill of Hill:Designs and a woman who knows the way to a runner's heart, Rachel Stewart. Rachel's praises were sung from Petaluma to San Jose. Her cuisine had us well nourished with just the right foods. At 4:00 AM she was flipping flapjacks, wondering if she would be home by 7:30 AM for the next Webvan delivery. Rachel's cooking expertise is equaled by her ingenuity. Using a canoe paddle, she stirred the rice and millet; and using her "oomph" she shouldered 30 bunches of swiss chard, (15 in a bag on each shoulder) through crowded aisles at the farmer's market. Would she do it all again? "Yes. At least I didn't have to walk up and down my stairs backwards with all that food." I can't imagine a better time to run than at night. It's peaceful and quiet. The Relay is always scheduled during a full moon. Hearing the night sounds, seeing the sky with those bright stars, being shrouded in soft shadows, smelling the sweet damp grass - it is my idea of a perfect run. I didn't want to relinquish the baton to my teammate Ngoc Tran. I wanted to keep running forever. But Ngoc was there waiting. I passed her the baton and watched as she slipped into the darkness. I decided she needed this run. Between legs, Ngoc studied in the back of the van. Even while the rest of us slept or rested, Ngoc studied. She needed a break from all that work. While running is usually a solitary experience and great for loners like me, there are times when what it takes to get up a tough hill is inspiration, support and team work. Each team had a different approach to get their runner to the top. Mooning by day would qualify as an excellent incentive. Second Date took a different tactic. We watched as teammate, Ingrida Gailitis tackled Leg 30, a grueling 3-mile hill. Corinne Suyeyasu met up with Ingrida to offer her liquids and support. And then Corinne began running with Ingrida. Stripe and Kimi Serrano joined in and we ran in shifts, talking, inspiring and supporting until Ingrida made it to the exchange to pass off the baton to Sherilyn Adams of Van 2. Later, Ingrida said she had never expected that type of support. "You would have done it for us, wouldn't you?" we asked. "Of course," she replied. Three days prior we had all been strangers. Now we were friends, bonded by running. There was a feeling of excited anticipation as Second Date entered Santa Cruz. Van 1 had finished the final leg hours before. Now Van 2 was coming into the home stretch. The finish line was in sight. But it was close to 7:00 PM. There would be no roaring crowds to greet us, no blaring bands. In fact, as we awaited the arrival of teammate Krista Christian, course volunteers began to dismantle the chute. Our finish would be met by only a scattering of faithful volunteers. But our spirits were not dampened. As Krista came into view with Margot Antonetty running by her side, a cheer erupted from the runners of Second Date. We joined Krista and Margot and ran to the finish line as a team. Photos were snapped, high fives were passed around and hugs were exchanged. Stripe distributed our finisher's medals. The race was done. The next morning, I awakened with what I've come to recognize as "post running depression." Two days later I would register for The Valley of the Sun Marathon in Phoenix. What does it feel like to finish this type of event? No matter where you finish in the relay, there is pride and camaraderie that perhaps only another runner can appreciate. Dagmar Beyerlein describes it best. The day after the relay, she says she was almost pummeled by a bunch of angry commuters. The commuters were irritated at the pace she descended the stairs (Dagmar counted 34 steps) to CalTrain. "I guess they were completely unaware of my newly gained stature as one of the queens of the Relay," Dagmar confided. "If they had known, I'm sure they would have carried me down on my throne." A belief we all share. And a throne no one but a runner can appreciate.